Last week, many of the beat reporters talked about two developments regarding Shawn Kelley. First, he’d be throwing more pitches/innings in his next few outings to stretch him out a bit, and second, he was going to revive the change-up he used as a starter for the Austin Peay Governors (a pitch he’d shelved after turning pro). He threw ten of them in his abbreviated start against Kansas City – how’d it look? Pretty darn good. The pitch averaged 83 MPH, or about 7 MPH less than his fastball. Second, its vertical break isn’t all that different from his fastball, which is normal for change-ups, but it still distinguishes the pitch from the ‘change-ups’ with splitter-like sink like Tim Lincecum’s or Zach Greinke’s. His control with the pitch is already exceptional – he’s always around the plate with it (9/10 strikes), and he kept the ball from the top portion of the zone. He gave up one hit on a change, a single to Billy Butler. Here’s a chart of his location with the change-up, with the strikezone in red (Pitch fx strikezone, not the ‘rulebook’ strike zone). There are some exceptional pitches on the black away from lefties, and there are a few scarier looking pitches in the heart of the plate. To be fair, most of these came against hitters who can’t hit change-ups (Jose Guillen and Josh Fields, I’m looking at you). So the optimistic view is that he was pitching to the scouting report; the negative view is that he made some bad pitches against the right team. Remember though, this is ten (10) pitches. This means nothing. 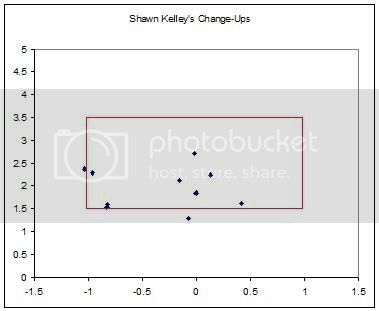 If you like Kelley, this is encouraging stuff – mostly down in the zone, not hit hard at all, etc. If you think it’s a bit late in the spring to be adding new pitches, you can point to what look like some mistakes. This isn’t all that meaningful, but it’s fun to look at and to speculate about. So far, the quotes from Kelley about having a lot of confidence in the pitch are borne out in his control. We’ll have to see about the results, but so far so good. Incidentally, why on earth did the M’s ever tell him to abandon this pitch? It’s worth noting that we don’t know if the Pitch F/x systems in the ST parks are calibrated the same way as the MLB parks, so I wouldn’t read too much into the velocity/movement data.